Customers and developers alike have been waiting for Google to permit the release of homebrew Chromecast apps—ones not made by its special partners, that is—and now they have a new reason to hope. The company could finally be poised to lift restrictions governing support for the TV streaming dongle. Google has invited several developers to its Mountain View campus next month for a hackathon centered around its Chromecast device and related software developer kit (SDK). The primary focus of the event, to be held December 7-8, will be to let attendees try out the “upcoming release” of the Google Cast SDK. The previous version of the kit was “a preview” only, which meant Chromecast devs couldn’t actually publish any apps that used it. Perhaps fittingly, the hackathon isn’t entirely open either. While any developer can sign up, access will be limited and preferential treatment will be given to those who have been using the previous preview SDK. 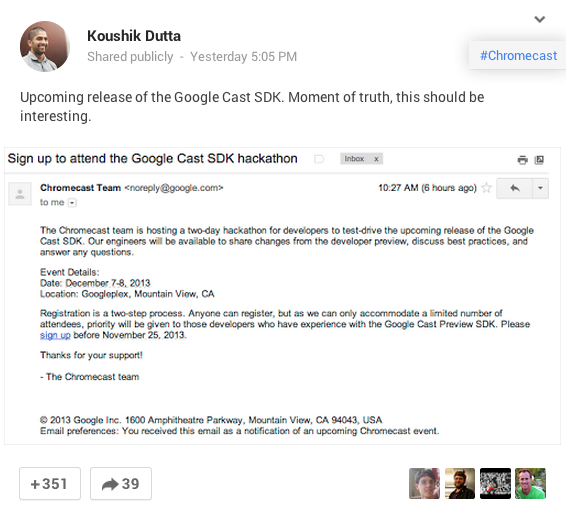 The Chromecast team is hosting a two-day hackathon for developers to test-drive the upcoming release of the Google Cast SDK. Our engineers will be available to share changes from the developer preview, discuss best practices, and answer any questions. Registration is a two-step process. Anyone can register, but as we can only accommodate a limited number of attendees, priority will be given to those developers who have experience with the Google Cast Preview SDK. Please sign up (link) before November 25, 2013. ReadWrite commenter “Appestry” tipped us off about the event, and it seems legit. Though Google’s Chromecast team hasn’t responded to my inquiry about this, others have piped up about receiving invitations at places like XDADevelopers forum, AndroidCentral, AndroidForums and Google Plus. Among them, notably, is Koush Dutta, the CyanogenMod/AirCast developer who has been extremely outspoken about Chromecast restrictions.